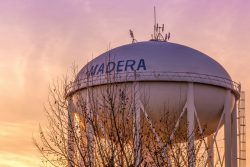 The Madera City Council adopts City codes (laws) designed to ensure the absence of blight, nuisances, and to maintain a clean environment for all residents. Code Enforcement works to promote and maintain a desirable working environment by administering a fair and unbiased enforcement program to correct violations of municipal codes and land use requirements in addition to working with residents, public service agencies, and other City departments. An abandoned vehicle is classified as one that is left on a highway, public property, or private property in such inoperable or neglected condition that the owner's intent to relinquish all further rights or interests in it may be reasonably concluded. Other types of vehicle violations addressed are those involving dismantled, wrecked, and/or inoperable vehicles. Allowing for such conditions to exist would be detrimental to our efforts as these create blight and are attractive nuisances. Animal Control – dogs running at large, licensing and vaccinations of dogs, dead or injured animals, barking dogs, poisoning of animals, possession of fighting animals, too many, unsanitary conditions. You may contact Madera Police Department at (559) 675-4200. The foreclosure program is designed to maintain properties within neighborhood standards. This includes disallowing overgrown lawns, bedding areas, and yards. Weeds must be eliminated and property must be kept in such a condition that is not blight or eyesore for the neighborhood. Make sure the property is free of trash and debris and is secure. This helps prevent the attraction of criminal activity on the property and promotes better neighborhood standards of living. Although we understand advertising is a crucial part of business, safety is always a main concern for our community. We want to ensure signs are not obstructing public right of way, posted on trees, utility poles, medians, etc. We also want to make sure that the signs do not cause blight which may devalue surrounding properties in the area. For more information on sign permits please contact the City of Madera Planning Department at (559) 661-5430. Public nuisances have a negative impact on neighborhoods and in some cases can be hazardous. Violations consisting of overgrown vegetation, furniture/appliances outdoors, broken windows and graffiti are some items that are considered to be public nuisances. These violations should be reported as it creates blight and encourages crime. The City of Madera has a significant interest in ensuring that rental housing remains a desirable housing option for its citizens and that rental housing is maintained to minimum living standards. On June 21, 2017 the Madera City Council adopted Ordinance Number 942 C.S. adding Chapter 16 to Title IV of the Madera Municipal Code pertaining to inspection of rental housing units. The Rental Housing Inspection Ordinance requires that all rental properties and rental housing units are registered and will be subject to routine periodic inspection by the City. Dwellings located in the City of Madera must meet the minimum standards of living per the California Health and Safety Code. Conditions to the extent that endanger the life, limb, health, property, safety, or welfare of the public or the occupants thereof may be declared Substandard. If you need an inspection or would like more information please contact our department. A building or structure which is unoccupied or illegally occupied and unmaintained for more than 90 days is deemed a vacant building. Vacant, substandard, or unkempt buildings discourage economic development and depreciate property values. It is the responsibility of property ownership to prevent owned property from becoming a burden to the neighborhood and community and a threat to the public health, safety, or welfare. One vacant building which is not actively and well maintained and managed can be the core and cause of spreading blight. In partnership with CalRecycle the City of Madera coordinates several programs to ensure Waste Tires are properly disposed and recycled. Several times a year a free Waste Tire Amnesty event is held for Residents of Madera (business’ are not permitted) at the Madera District Fairgrounds. The Revitalization Department also performs routine inspections on Waste Tire Generators within the City limits to ensure waste tires are properly stored and disposed of. Please contact us if you would like more information on these programs. Vacant lots are inspected throughout the year for brush, wild vegetation, and refuse. The primary goal is to protect residents and residential neighborhoods from fire hazards and blight. Please contact us to report excessive weeds. See a video on weed abatement. Most additions, alterations, and improvements require proper permits from the Building Department. It is unlawful for any person to engage in business within the city limits without first having obtained a business license from the City of Madera. Yard sales are permitted only the 1st Saturday and Sunday of each month. Detached structures greater than 120 square feet require permits from the building department. It is illegal to dump refuse of any kind within City limits.